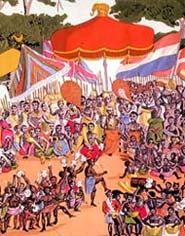 The word Ghana means "Warrior King" and it derives from the ancient Ghana Empire. 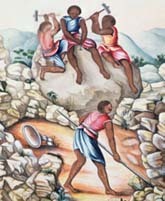 This land was in fact inhabited in pre-colonial times by a number of ancient Akan Kingdoms. Trade with Europeans states flourished after contact was made with Portugal during the 15th century. The region would eventually become a British Crown colony called Gold Coast, and more than 30 forts and castles were constructed. For centuries the Gold Coast was known as 'The White Man's Grave' due to the amount of Europeans who perished from malaria and other tropical diseases. The merger of Gold Coast and the Togoland trust territory, officially formed Ghana in 1957, and it became the first sub-Saharan country in colonial Africa to gain its independence. 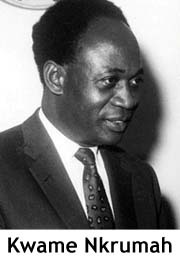 The first prime minster of Ghana, Kwame Nkrumah, was known as the president of the modern Ghanaian state, and an anti-colonial leader. He became the first head of state to offer the idea of Pan-Africanism, a movement aimed to "unify and uplift" African peoples, which he grew familiar with during his studies abroad at Lincoln University in the state of Pennsylvania, U.S..
A long series of coups led to the suspension of the constitution in 1981 and a ban on political parties. Many natives fled Ghana in the aftermath of the ban, migrating to other countries, and the economy significantly declined as a result. After a ten-year hiatus, political parties became legal again and many parties were formed. The major parties are the National Democratic Congress, the New Patriotic party and the Convention People's Party. Ghana has many natural resources, giving it a much higher per capita output than the poorer countries in West Africa. However, it is still dependent on trade and international assistance. In 2007, an oil field was discovered offshore and oil exploration continues along with the production of oil.